The Steepest Vehicular Inclined Plane in the WORLD! Johnstown sits at the confluence of the Stonycreek and Little Conemaugh rivers. This union forms the Conemaugh River, which continues through the valley and eventually empties in to the Kiskiminetas. At this confluence, the rivers are surrounded on all sides by steep hills which leave little flat ground for buildings. Johnstown is well known for its catastrophic flood of 1889, but this city also has a positive claim to fame. 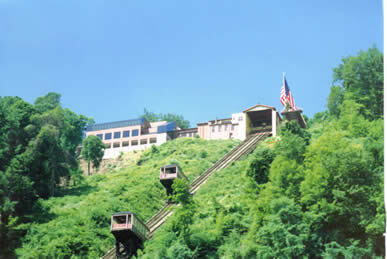 It is the home of the Johnstown Inclined Plane, the steepest vehicular inclined plane in the world. An inclined plane is a short railway that runs up the side of a steep hill and raises and lowers cars on cables. The Johnstown Inclined Plane is a vehicular inclined plane because the cars are large enough for automobiles to be taken up and down the hill. Johnstown Area Heritage Association (JAHA) has created flexible thematic threads for use with several historical sites located in Johnstown. Threads focus on different disciplines and topic areas to help you tailor class visits to meet your instructional goals. Each thread includes discussion topics, primary sources, and learning activities for students before your visit, during your visit, and further exploration after your visit. With extensive galleries of artifacts, photos, and documents from the JAHA collections, even classes outside of western Pennsylvania should be able to complete most of the learning activities located on this website. The curricular thread for the Inclined Plane pulls from many different disciplines. These materials are targeted at older elementary students, since most teachers are quite adept at adapting instruction up or down, to meet the ability levels of different aged students. JAHA has also referenced standards from all subjects that touch upon the topics discussed here. The referenced standards are available for each of JAHA's curricular threads. Please let us know your suggestions and experiences working with these materials. We look forward to seeing you and your class! Made possible through a generous grant from the Inclined Plane.